The Arabian Dictators are furious with Pakistan for taking a Principled sensible stand over the Saudi-led aggression on Yemen. Pakistan’s parliament voted overwhelmingly not to get militarily involved in the fighting and instead work towards a Peaceful resolution of the crisis. The Arabian dictators think that they own Pakistan and its leadership , and it is not good enough; Pakistan should jump the moment they say so. For once, this is not the case. Pakistani parliament’s principled stand to remain neutral in the Saudi-led aggression on dirt-poor Yemen has aroused the Fury of tiny United Arab Emirates (UAE). The pip-squeak statelet—essentially a tent and a camel—led by Bedouins are threatening nuclear-armed Pakistan with dire consequences. He added that Pakistan should take a clear position “in favour of its strategic relations with the six-nation Arab Gulf cooperation Council”. “The vague and contradictory stands of Pakistan and Turkey are an absolute proof that Arab security — from Libya to Yemen — is the responsibility of none but Arab countries,” Gargash said. What security in Yemen is the Emirati official talking about? The dirt-poor Arab country has been attacked by the desert Bedouins causing massive civilian casualties , and these Sheikh , who have a long history of Being Looters and Dacoits , and especially , the Ale Saud who have a clear History of a Bunch of Looters and Killers , who usurped the Power of the Muslim Rulers of Turkish Empire with the help of the conspiracies hatched by the British Rulers , to have their influence in the Arabian Peninsula . The Yemenis have not threatened any of them. The situation in Yemen is due to the Corrupt and Impotent Rulers , who have minted Money , and have always compromised over the Prosperity of the Nation , for their Personal Benefits , as similar is the case with all these Sheikhdoms ,who are Just stooges of the Western Powers. Yemen has existed for thousands of years; these tent-city states are the creation of British colonialism and emerged on the map in 1971. As for Libya, what great feat have these Bedouins performed? The oil-rich country lies in shambles after the Arabian Bedouin Sheikhs joined in a shooting spree led by the US and its western allies. Can any of these Arabians set foot in Libya today after its so called “liberation”? They are busy destroying Yemen as well but it may not be as easy as Libya. They have been cushioned from the Libyan turmoil because it is far away from their borders. Yemenis, like the Afghans are born fighters. It is highly unlikely that the Bedouin aggressors will get away with their crimes in Yemen. By launching this war, the Arabian dictators have put their hands in a hornet’s nest and they now want Pakistan and others to wage their war. “The Arabian (sic) Gulf is in a dangerous confrontation, its strategic security is on the edge, and the moment of truth distinguishes between the real ally and the ally of media and statements,” Gargash tweeted soon after the Pakistani parliament passed a resolution on April 10 insisting on neutrality in the Yemen conflict. If the Persian Gulf Sheikhs feel there is a dangerous confrontation, this is the result of their own folly. Far from helping to resolve the crisis in Yemen through facilitating a dialogue between the various parties, they have launched a war of aggression. Once the dust settles, there is a possibility that the aggressors might be hauled before the International Criminal Court (IC) on war crimes charges. 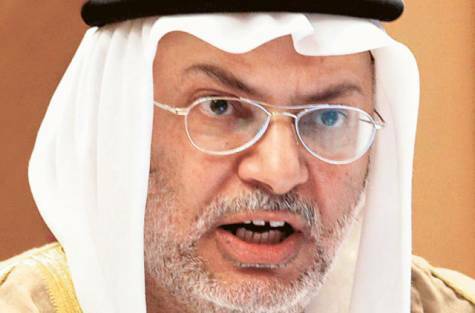 The Emirati and the Saudis who have been for long been involved in Promoting sectarianism and in some areas of Pakistan , like Balochistan and especially Karachi , have been also involved in ethnic divide of the Our Nation , as now Once more wants to Paint their aggression on the Poor Yemeni People into sectarian conflict , as the UAE foreign Minister even further said that Pakistan is siding with Tehran and Istanbul , instead of the Persian Gulf Sheikhdoms. “Tehran seems to be more important to Islamabad and Ankara than the Gulf countries,” Gargash said. These Sheikhs who are very much Proud of their Wealth , and even who are begging for Pakistani support , are the same Sheikhs who treat the common Pakistani , who go their countries to earn a living , are treated as the Dirt cheap insects , instead of being treated as Brothers from a Muslim country. While at the same time , Irani and Turkish People , pay the due respect to the Visiting Pakistani , coming to their Nation. It is not far away that they ll even salute the Pakistanis , In the near future , as the Defenders of Pakistan have now taken a stand to Protect the Nation from all types of Corruption , whether it may be terrorism , Political Corruption , or financial Corruption , as it has fatally degraded and demoralized the Nation , that even tiny Sheikhdoms like UAE , have started to threaten Pakistan of dire consequences. As at the moment the Common Pakistani is of the Belief that the Pakistani Armed forces , must help the Population of the Muslims Brother Nations , who are trapped in Miseries and are in deep Poverty , due to the Corrupt and Looters of the National Wealth , especially the Arab Sheikhdoms , to send a brigade of its elite commandos and take over the palaces of these alcohol-guzzling, prostitute-consorting Bedouins , and liberate the Masses from the Unjust Dictators , who are spending the National wealth on their Lavish Life Styles at the cost of the Poor Citizens . They would then be justified in seeking Pakistan’s protection. This entry was posted in Jafria, Middle East, Pakistan News and tagged Nuclear State, pakistan, Saudi Aggression, Saudi Yemen War, UAE’s Minister of State for Foreign Affairs Anwar Mohammed Gargash, Yemen. Bookmark the permalink.